Rangashala: Are we really the best at youth level? Here is a link to my first article for GoalNepal.com, Bikram Thapa's excellent Nepal football website. 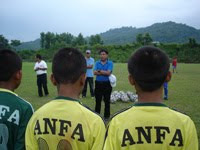 The piece addresses whether Nepal is the best at youth football in the South Asian region. I did go through your article and even posted a comment. But I am not sure if the web master will deem it appropriate for print for the simple reason I directed my ire against ANFA. Your take on the issue hit the bull's eye . The less said the better because you have higlighted the facts in detail. Keep up the good work. Looks like they were brave enough to post your comments.